Systematic or machine trading is no panacea. It is a tool. It’s seductive to think that we can turn our investing or trading over to a money making machine, then sit back and simply count cash as it rolls into our account. Feet up, cold drink in hand, watching the waves lap at your feet, your impossibly attractive spouse strutting around commanding attention, and your perfectly behaved offspring building the perfect sand castle… all while your wifi-connected laptop resting on the side table continues to ring the register. We’ve all had some version of this day dream, right? I recently spent some time with a local colleague who wanted my advice on a futures trading program he recently purchased. He wanted me to dig into the nuts & bolts of the multiple systems it trades and see if I can detect any red flags that he should be aware of that might be exposing him to unplanned for risks. The good news was, I could not. Nothing beyond the usual “systemic risk” things like flash crashes and slippage risks. The metrics, rules, and backtests all look impressive. The greatest risk he’s exposed to is himself. 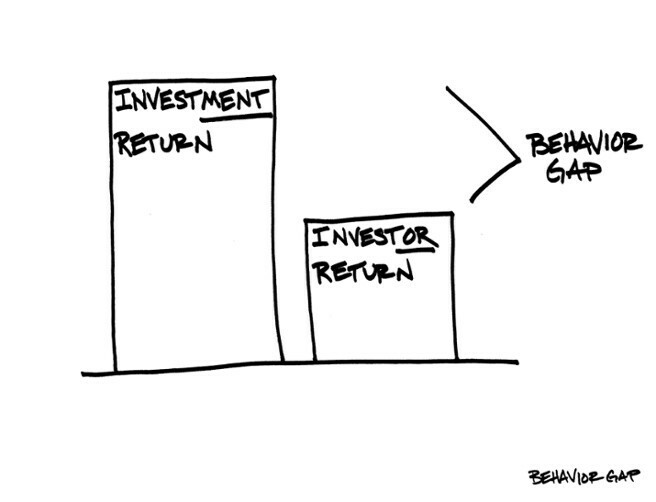 My friend Carl Richards calls this the Behavior Gap. In a nutshell, the behavior gap accounts for the difference in actual results verses what the model says you should’ve earned. The behavior gap is the result of the actions you’ve taken outside of the rules of your system or strategy. The usual culprits leading one to stray outside the lines? Fear and Greed. Fear that a drawdown may get worse or greed that a huge money making opportunity might get missed if I don’t jump in early! Greed that causes me to take a “large” profit early because of a fear that it might get away. No system, auto-trader, or Artificial Intelligence machine stands a chance against a human with the power (and likelihood) to pull the plug at the worst possible time. Humans are human and machines are simply a tool. Man + Machine, when harnessed properly under the right conditions with the proper human expectations in place is where edge in the marketplace now lies. But remember, in the end, it all comes down to you. Take responsibility. Take ownership. If you’d like to learn more about how you + machine together can surface better trading ideas, please visit Trade Ideas to learn about our Artificial Intelligence Engine we call Holly.